It’s nearly impossible to get good results from your guitar practice when you have musical goals that are not clearly defined. This frequently overlooked mistake leads to extremely slow progress and tons of unnecessary frustration. You achieve results with your guitar practice much faster by making your goals as clearly-defined as possible. This begins with setting long-term guitar playing goals, then working backwards from them to determine the steps that lead you to your goal. This reveals the guitar skills you need to master, so you know exactly what to practice to improve. Which of these goals is more likely to create a clear destination that can be reached with a specific practice routine? It’s a no-brainer. Breaking down all your guitar playing goals like this helps you become the guitarist you want to be MUCH faster! Now that you know the first step to take for reaching your guitar playing goals, learn how to practice more effectively to reach them even faster. 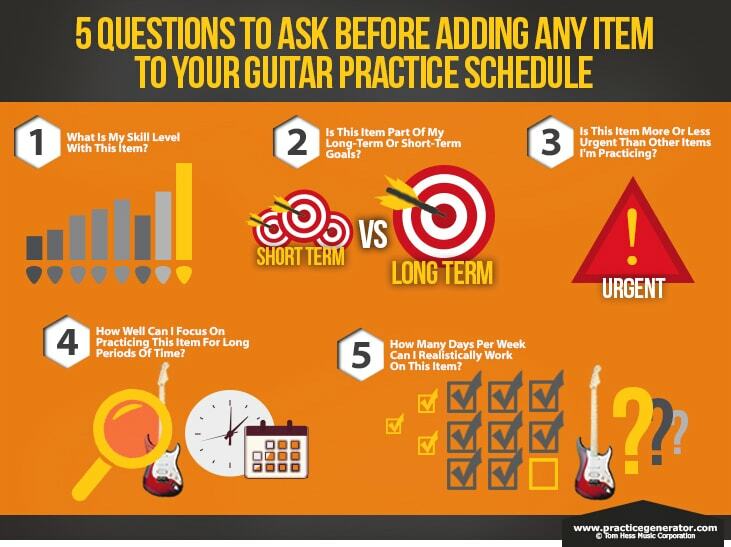 Read this guitar practice article to learn how to reach your guitar playing goals fast using an efficient practice schedule. Get the secret weapon to accelerating your guitar playing progress.